India is a ginormous country. It is a democratic country which is multitudinous in a large scale of earth from East to West and North to South. There are total 32 provinces (including Union Territories) in India and each province has different kind of people, having different cast, religion, tribes and sub-tribes. Each community has different clothing, meals, and life style. In this connection you will learn about special cousins from some province. We will share the knowledge with you. Let us have a look on below. Here in Delhi at our Cooking Classes, we believe that cooking is not chemistry it's an art. 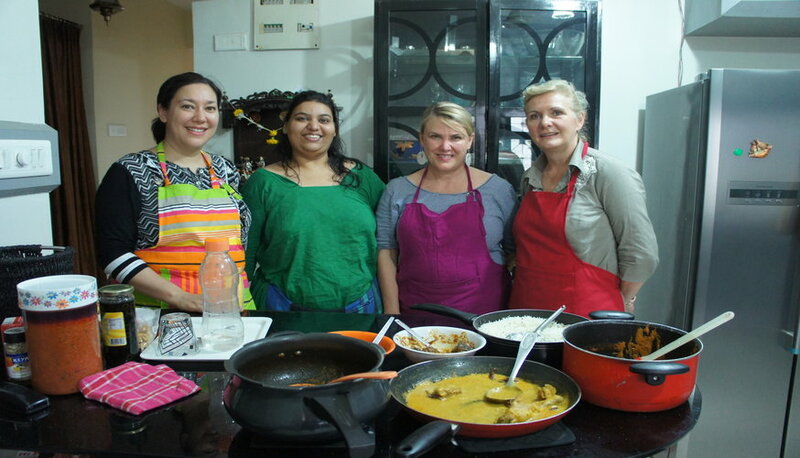 We offer a wide variety of Cookery Courses in Delhi which are easy to learn. Come and learn - Discover the chef in you! We offer a wide variety of Cookery Courses for a wide range of audience. All courses are prepared keeping in mind that recipes ate made easy to learn and easy to cook. Each recipe is created after careful study and research, taking care of the nutritional value of each ingredient. Note: Each course is a 1 day class, unless stated otherwise. We also offer Individual classes on request, with recipes and timings customized as per the individual requests. Individual classes are extremely popular with international students. Mughlai Cuisines-Learn the traditional mughlai recipes including: Dal Makhani, Makhmali Kofta, Jhatpat Shahi Paneer, Veg Plateau Biryani and Lachcha Pudina Parantha. Indian Favorites-Learn some of the North Indian favorites, including: Chana Masala, Kundani Aloo, Veg Jalfrezi, Methi Malai Matar, Amritsari stuffed kulcha. Class Schedule- As per current schedule or group�s suitability. Rajasthani Food-The finest cuisine in India was derived from the Mughals and, along with European cooking, influenced the royal kitchens of India. But in Rajasthan the common man�s kitchen remained untouched. Cooking here has its own unique flavor and the simplest ingredients go into preparing most dishes. Scarcity of water and fresh green vegetables has had their impact on the cooking in the desert areas of Jaisalmer, Bikaner and Barmer. Instead of water the women prefer to use milk, buttermilk and clarified butter. Dried lentils and beans from indigenous plants are used liberally. Gram flour is a major ingredient and is used to make delicacies like �khata�, �ghatta ki sabzi� and �pakodi�. Bajra and corn, the staple grains, are used to make rotis, �rabdi� and �kheechdi�; and various chutneys are made from locally available spices like turmeric, coriander. Local Rajasthani Food-�Dal-baati�(dumplings with a filling, roasted among hot coals) and �choorma�(dry, flaky, sweet crumb pudding) are the universal favourites. The non-vegetarian dishes include �soola� or barbecued meats, marinated with a local vegetable. But it is the sweets that the Rajasthanis freak out on. Each part of the State has its own speciality � so Jodhpur and Jaisalmer are famous for their �laddoos�, Pushkar for its �malpuas�, Bikaner for its �rasgullas�, Udaipur for its �dil jani�, Jaipur for its �mishri mawa� and �ghevar�, Ajmer for its �sohan halwa�; and mouth watering �jalebis� can be found in all cities. Our Cochin workshop has been involved in 'At Home' hospitality for more than twelve years. Our professional cookery instructor for more than twenty years experience offers food and hospitality to foreign guests. Head of workshop belong to traditional Syrian Christian community in Kerala. In keeping with the tradition of their families they enjoy having guests and serving good food. We conduct cookery classes. Our instructor (Nimmy Paul) teaches guests the nuances of traditional Kerala recipes. She is also a food consultant to writers, chefs and magazines. Articles by her and about her have appeared in magazines and newspapers. 3. Stay At Home: Spend a few days with Nimmy. Emphasis is given to learning and sampling traditional Kerala cookery. (Most guests make advance bookings prior to their visit. It will help Nimmy a lot if you do so too. If you have any special interests, in any traditional Kerala recipes please inform us. ACHA�s Inji Kari-Inji Kari is easily described as a sweet and sour ginger sauce. This particular recipe was my father�s favorite, and my mother made sure it was on the table for lunch every day for more than ten years. I like to remember this recipe by his name; we used to call him �Acha�. Meen Pattichatu-This is usually a fiery looking fish preparation with a rich red gravy. For many people this can be a hot dish because of the chilies. We use Kokum for the inimitable flavor that is the trademark of this dish. Every Kerala housewife makes this regularly. I have made it rather mild for a change. This goes well with rice. We also have it with cassava. Pallappam (Crisp Laced Rice Pancakes)-A classic Kerala bread, this is supposed to have been introduced by the Portuguese centuries ago, from Ceylon. It was for many years a typical Syrian Christian food. It s still served in Christian families for breakfast. It has also developed appeal among other peoples of Kerala too, and is regularly served as a starter for lunch and dinner. Idiyappam (String Hoppers)-Another bread alleged to have been introduced by the Portuguese. This has almost the same appeal as the Palappam. Easier and quicker to make, this goes well as a starter, as a breakfast, snack, and as a meal with suitable accompaniments. Meen Molee (FISH IN COCONUT MILK)-Some call this Fish Molee. We usually make this with seer fish. But other fish lend themselves well too. The tomato gives a mild tartness, and the green chilly, ginger and garlic combination will assuredly be a surprisingly pleasant experience. We use this combination a lot. Taste the magic of Uttaranchal/ Uttarakhand recipes. The traditional cuisine of Uttaranchal/ Uttarakhan is highly nutritious, simple to prepare and at the same time appealing to the palate. Several of recipes are special to specific occasions or festivals. To mark the welcome of a guest or relative, PURI and SHINGALS (SHYALI) are generally served with Aalo ke Gutke. The presence of JAHKYA adds up to the taste. Alu Daal Pakora (Potato and Pules Dumplings)- Aloo Daal Pakora is served as a snack and is one of the favorite snacks of the locality of the Kumaon. It is served with chutney or tomato ketchup. It is an innovative food of Kumaon. Aloo ke Gutke-(Pieces of Boiled Potato with spices)- Garhwali and Kumaoni snack prepared from Boiled Pahari Potatoes. Baadi-Baadi is made from Kwada ka Aata (also known as Choon or Mandua flour and is black in color) Baadi is best eaten with Gahat ki dal or Phaanu.Hot Baadi and hot Phanu is very popular food in Uttaranchal / Uttarakhand. Bhang ki Chutney- A taste Sour Chutney prepared with roasted Bhang seeds (Hemp Seeds) and cumin seeds ( Sauf), mixed with Lemon juice. It is so testy. Chainsoo- Chainsoo is prepared by using black gram daal (Horse been). Normally due to the high protein content in this daal it is difficult to digest. However it is said that the bad effect gets nullified by roasting. Similar preparation with slight variation is made out of black bhat (a varity of soyabeen), but in that case it is called bhatwani. Phaanu- Phanu is also made of dals (lentils) like chainsoo, but in this case the dals are soaked in water for about 4 to 6 hours before its use. A different variety of dals like- Gahat, Arhar or green Mung can be used to prepare Phanu. Kaapa- This is a green curry that is served in lunch or dinner and is eaten with Bread, Pita, Roti & Boiled Rice. This is a dish, which is very sumptuous as well as nutritious since it is a special preparation of Spinach. Kafuli- Kafuli is a thick gravy preparation made from green leafy vegetables. Kafuli made of Spinach leaves is the most common preparation. Gahat (Kulath) ki Dal- Dal prepared from Gahat, tempered with Gandharein (Angelica Glabris), Asafoetida (Hing) and Cumin (Sauf) seeds. Jholi- Jhol means very thin gravy. Jhol can be made out of tomatoes, potatoes and other tubers. On the other hand Jholi is gravy made out of curd. It is comparatively a much thicker jhol and similar to phanu in preparation. Thechwani- Thechwani can be prepared using radish root (pahari mula having round root) or potatoes. The preparation is called by this name as the radish root or potato is never cut, but crushed (thinchao) into pieces. Roat- During marriages and other family or religious functions certain traditional Garhwali dishes are prepared, the most important among them are Roat and Arsa, besides `urd ki pakori, pooris , kaddu ki bhujji and alu-tamatar ka jhol are the most common dishes made during these occasions and the festive seasons. Jhangore ki Kheer- Sweet dish prepared with Jhangora.